A packed house of over 5,000 software developers watched as Apple’s Steve Jobs introduced the latest operating systems for the Mac computer and for iPhone, iPad, and iPod touch at the recent Apple World Wide Developersâ€™ Conference 2011. He also talked about a new service, iCloud, which stores content on remote servers and makes synchronization of multiple Apple devices, Macs, and PCs as easy as using Apple’s ubiquitous iTunes. 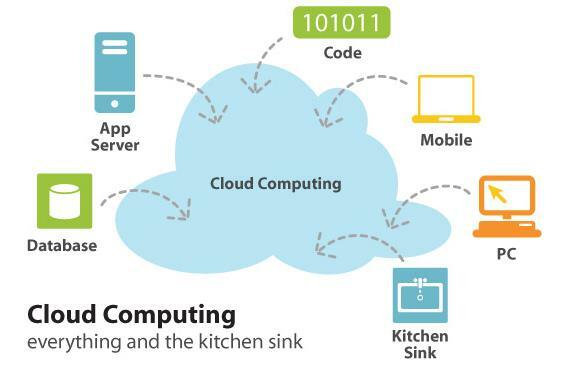 Cloud computing, where documents, data and more are stored remotely so you can access them from a connected machine like an iPad or a computer, is not a new concept.Â It was most probably derived from the diagrams of clouds used to represent the Internet in textbooks and resulted when telecommunications companies made a radical shift from point-to-point data circuits to Virtual Private Network (VPN) services in the 1990s. By optimizing computer resource utilization through load balancing, they could get their work done more efficiently and inexpensively. But leave it to Apple to bring the Cloud to the masses in a big way (although it was Google Docs in 2006 which really brought cloud computing to the forefront of public consciousness). While the jury is still out on whether Google docs is a serious competitor to Microsoft’s Office suite — researchers from Pennsylvania State University recently determined that the cost of running small workloads though may actually be more expensive for larger compute jobs, compared to the costs of running such work in-house — there are still many Google Docs success stories. And Google continues to enhance Google Docs with a recent upgrade including a new feature that lets users discuss shared documents in real-time. Unlike Google’s cloud-based service, Apple’s iCloud uses the cloud â€œto orchestrate data streams rather than control themâ€ according to a recent ZDNet article. The cloud is used as a central repository for apps, music, media, documents, messages, photos, backups, settings, and more. Both Apple and Microsoft have been exploring the idea of a â€œcentral hubâ€ of our digital life and work for over 10 years, with a variety of devices relying on it to coordinate content. For Apple, the packaging of the this hub in the form of the iCloud service is also a sound business strategy. The New York Times reports that Apple’s iCloud has the potential to wipe out some existing web services and entire businesses with the integration of iCloud, Mac OS X Lion, and iOS 5. These businesses include: Instapaper, Red Pop hardware iPhone camera button, BlackBerry Messenger and GroupMe, Amazon Cloud Player and Google Music, Google Docs and Google Chromebook, and Dropbox. Despite the cloud’s potential for cost savings and â€œreducing the hassles of running in-house computer servers,â€ the LA Times reports thatÂ it may not yet be as safe as advertised. Because data from hundreds or thousands of companies can be stored on large cloud servers, hackers can theoretically gain control of huge stores of information through a single attack â€” a process called “hyperjacking.” Security professionals said the many attacks recently in the news reflect both an increase in hacking activity and new pressure on companies to quickly disclose when they’ve been attacked. A recent study by Baseline shows that while many organizations are still holding back, fearful of security hacks, lost data, or lost control, a growing number of enterprises are driving their business to the cloud. They interviewed several companies including Kelly Services, Lionsgate Entertainment, HarperCollins Publishers, GWR Medical, Imperial Sugar, WhitePages, Suncorp, and Dubset.Â TheirÂ findings reinforce the opinions of the CEO panelists at the MIT Sloan CIO Symposium, held in Boston in May. The panelists at the keynote address, â€œOpportunities and Strategies in the Digital Business World,â€ spoke about the cloud as a way to free up capital so companies could take advantage of new business opportunities. Microsoft’s Steve Ballmer implicitly acknowledged the importance of the cloud services in a recent interview â€” Microsoft is set to announce their answer to Google Docs: the Office 365 online service. And Jan Muehlfeit, European chairman of Microsoft Corp., sees the future in cloud computing. Apple, Google, Microsoft, as well as Facebook (where many people already store the major events and interactions of their lives on the cloud) seem to be betting their billions on a cloud-based future. What might this future look like?Â SF writer Rick Moss poses some fascinating possibilities and questions in his new novel, Ebocloud.Â The â€œebocloudâ€ is an internet social network subdivided into tribes formed by shared affinities (think Facebook). The cloud addresses, as one character says, â€œthe primordial urge for belongingâ€ and the end of aloneness. The cloud learns from the actions and interactions of each of the members (called cousins) who are connected to the cloud with â€œdigital tattoosâ€ using brain-stimulating and brain-computer interfacing nanotubes. Moss asks what happens if the interaction with the cloud became two-way? What if the cloud could begin to affect emotions? â€œThe objective of the human-cloud collective is to facilitate a feedback loop whereby human sensory data and biometrics are uploaded to the cloud to be aggregated, analyzed and used in various applications, then redistributed back to the human participants,â€ says Moss in a recent interview for H+ Magazine.Â He sees this interaction resulting in what he calls a â€œsocial singularity,â€ a transhuman superintelligence emerging from â€œthe cloudâ€ network.